Products. It's not just about making them look good. It's making them look good enough to buy. Companies. It's not just portraying cheerful and attractive faces, nice buildings and neat interiors. How do you make your firm look like it means business? Like it will make and deliver the goods? These are jobs that require great insight, that need research and conversation. As well as the state of the art equipment, technical skill and experience to produce images that work for you. Great Scot Corporate Photography Glasgow can make your food products look good enough to eat, can turn a piece of rotomoulded plastic into - not a work of art - but something that communicates its function and form to the customers you're aiming at. And when it comes to profiling your company, to telling your story, Great Scot can recognise and photograph the essentials, get to the core of the message you want to send, and make it visual. Products, people and process. Putting them into pictures is our job. Making those pictures tell the story you want and need is our mission. We do it quickly and economically, too, delivering promptly in the finished form you require - high quality prints of any size or mount, or electronically. Turnaround is swift. Quality is unsurpassed. If your thinking about getting portrait photography, then look no further. Please just get in touch and we will be only to happy to talk you through the full process, we are very approachable and friendly, just use our online contacts form and we will email or call you you back by return. Hear at Great Scot, we know that a picture is worth a thousand words and have decades of experience in what we do. 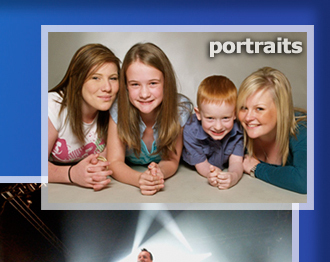 Our portrait packages start from only £75. From South Africa to Australia, the USA to the most remote outposts of Europe, Great Scot has worked in some of the most breathtaking landscapes imaginable. But the truth is, nowhere is more spectacular than Scotland. And taking a beautiful view is much more than simply pointing and shooting. Decades of experience have taught Stewart Cunningham the value of time and patience. Of being prepared to wait. But then, recognising the micro-opportunity and squeezing the shutter release at the perfect moment. It's also about technical skill. Painting with light. Knowing how to use the light available to display a scene to its greatest effect. And having the equipment and expertise to do that. So Stewart's landscapes can be thumbnails on the web AND giant wall hangings. Canvas show prints or magazine illustrations. He brings the same care, attention to detail and commitment to quality to all his work. And his eye for a lovely piece of scenery is legendary. It's so much more than a snap. "I've known and worked with Stewart Cunningham of Great Scot Photography for over a quarter of a century" says journalist and broadcaster Tom Morton, "and I can safely say that when it comes to music and media photography, he's really quite good. "Joking aside, Stewart has produced the goods for publication under some of the most trying circumstances imaginable. Established rock stars are sometimes the easiest people to photograph. And the hardest to do well. Stewart's done them all. The Stones, INXS, Proclaimers, Tom Petty, John Martyn, Simple Minds, Big Country, Eurythmics, Dire Straits, Wet Wet Wet, Richard Thompson... even Take That when they were a boy band. "But snotty youngsters who think they're already gods and goddesses can be the most difficult to work with. Yet time and time again I've watched Stewart produce pictures that they -and their management - could be proud of. "Live concert photography is incredibly difficult to do well, but I think I can guarantee that using Stewart means a guaranteed, high quality result. We used to work, for the old weekly Melody Maker in the pre-digital days, to very tight guidelines that required each shot to be perfect, without any way of knowing what the results in the darkroom would be like. There was no room for error, with a Red Star overnight rail delivery the only way of getting finished prints to the presses on time. And Stewart never failed." "Stewart and I did stories together for the Herald, the Scotsman, Melody Maker and many other papers and magazines. Bands, either in live reviews or as features and interviews, were always great because Stewart really loves music. it was always more than a job for him. It was a passion. And these days, even at his advanced age, it still is! the pictures he's taken recently of the likes of Edwyn Collins or young bands like The Fortunate Sons playing with a legend like Terry Reid are really superb." It's really quite simple: if you need to be in the news, if you need to BE the news, then there needs to be a photograph. But not just any picture will do. It needs to tell the story. And it could be your story. Great Scot Photography's history is in news. Newspapers. Everything from local weeklies to mass circulation dailies in Scotland, England, America, Australia and Africa. In the era of the internet, much has changed, but the need for a picture that tells a story hasn't. And from sport to politics, from the arts to hard science and industry, Great Scot has delivered and still delivers the goods to the professional press. We can advise on what will make a photo opportunity, and what will not. 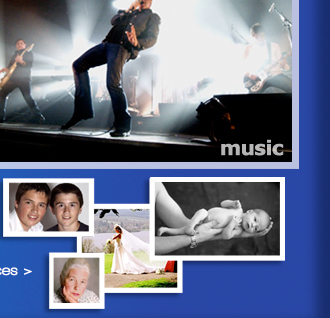 We can take pictures carefully targetted at different publications. It's crucial to recognise the difference between a professional journal and its requirements, and a tabloid daily newspaper. The difference between a 'soft' feature and 'hard' news. Great Scot knows about 'viral' communication on the net, the way photographs can become cult viewing on PCs worldwide. Tweaking a picture for that market is a skill rooted in the old-fashioned demands of the newspaper picture desk: where's the story? don't tell, just show. Sometimes, taking that picture can involve stamina and even risk. From world news events, to roped-up climbs on Gibraltar; at the feet of footballers and manhandled by riot police, Stewart Cunningham of Great Scot has kept on clicking that shutter. But for you, in a less fraught environment, he can take time to identify the story, and turn it into irresistible visuals. In the world of digital photography, instant is everything. Yet all too often, sharing and showing involves disappointment due to delay, while copies are distributed over the web, or camera displays are passed from hand to hand and held...at just the right angle. Just imagine: a party or dinner, a night out or a big night in. And the photographs become part of the evening. First, professionally taken, properly edited pictures are projected onto screens during the dance, dinner or while cocktails are being consumed. Mere minutes after the photographer has unobtrusively taken the shots. Then, instant, high quality die-bond prints can be purchased, at very reasonable prices, in protective mounts, right through until the end of the evening. The perfect talking point during the night, and a wonderful souvenir to take home afterwards. We have state of the art, highly portable kit than can do this for events both large and small, corporate and private, wild and noisy or discreet and dignified. people see themselves projected onto the screens while they enjoy themselves.